With 30 yrs experience with Voodoo & Wiccan magic between us, we will be sure to please. For example a spell to rid one of anger must be done during the waning moon but, to control the person & make them be nice and not lose their temper, that would be waxing, poppets are typically done on the full moon or the waxing moon. We don't do any work on the New Moon. Thank you for your understanding as your satisfaction is our only concern. P.O.Box 236921 Cocoa, FL 32923 U.S.A.
Also be sure to check your SPAM FOLDER for our reply if you do not hear back within 24 hours It is your responsibility to make sure you send us all applicable information that includes pictures of all targets including yourself, Logos, full names & to send us taglocks for the dolls. 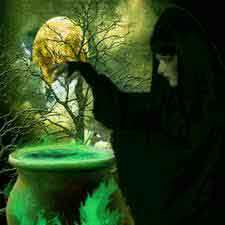 You do not need taglocks for the Spells/hexes or curses but, they can be added to Gris Gris bags. IF we do not have your pictures (if you have any), Full names or information we need to do your work, you will be placed on a "Could not complete" list until the following Moon phase your work was scheduled for.